What do you think about Ukrainian women? To be honest, I think that they are some of the most beautiful women in the world. Their Slavic faces, their soft porcelain skin and their long legs have the power to turn a left-brained man into an emotional mess. That’s why guys all over the world want to meet them, date them, and marry them. And that’s why there are hundreds of dating sites, matchmaking services, and marriage agencies that allow you to meet Ukrainian women from Kiev to Odessa. Just look at some of the girls you can meet on Victoriabrides.com. Ukrainian women are in demand and today I want to share another dating site with you that try to meet this demand. I didn’t know what to expect and I also didn’t know what kind of girls I was about to meet. But I knew one thing for sure. 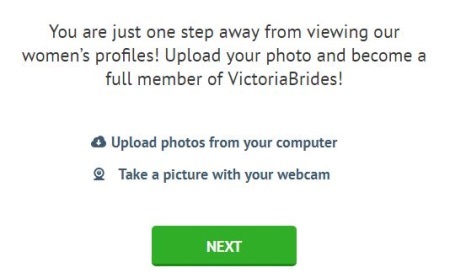 Victoriabrides.com is very similar to this dating site. Guess what? They are run by the same company. While Victoriahearts.com is a new dating site, Victoriabrides.com exists for years. To be honest, it’s quite similar. The design is the same. The signup process is the same. But the girls are not the same. And the reaction of the girls is definitely not the same. You can clearly see that Victoriabrides.com is in business for a couple of years whereas its sister site is in business for a few months. If you join this dating site for free, you will find more members and you will get more attention from girls. 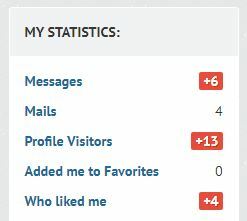 You definitely get more attention from girls on Victoriabrides.com. And even though I can’t tell you whether or not this letter is real, it doesn’t sound as over the top as the letters that I received on Uadreams.com. However, I’ve never met any of the girls I chatted with and I also never met the girl who wrote me this letter. I can only hope that she is real because her pictures are so beautiful that they make me want to book a flight to Kiev. The one thing I really like about this site is that it’s ridiculously easy to use. One click is enough to see the girls who are currently online. Another click and you can search for girls in a specific age range. You can search for girls, check your messages and you can see all the female members who are currently online. It’s a simple navigation, but it works. Who says that international dating sites have to be complicated? Of course, I can’t promise you that you will get flooded with likes and messages. Like I said, in my case it took a couple of minutes until I had the first message in my inbox. But it didn’t take long until I received the second message, the first like and the first letter. You don’t have to pay a cent to join Victoriabrides.com. 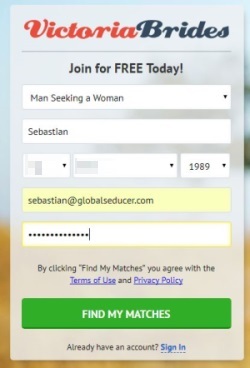 All you have to do is to type in your email address and your birthday. Oh, and don’t forget to say that you are a man seeking a woman. You don’t want to join the site and see a bunch of dudes. It’s free to join, but what does it cost to reply to messages and to letters? Even though this is a Ukrainian dating site, it’s not comparable to UkraineDate. You don’t pay a monthly membership fee that allows you to chat with as many girls as you want. Instead, you purchase credits that you can use to answer messages and letters. The good news is that it’s not expensive to get started. You can get access to all premium features and 20 credits for $9.99. That’s not enough to exchange dozens of messages, but it’s enough to reply to two messages and to see if you want to continue to use this dating service or not. What if you want to get started on Victoriabrides.com? It all starts on the homepage and with the signup box that I shared with you a couple of paragraphs above. After you typed in your name, your email address, and your password, you’ll get an email from the Victoria Brides team. This email contains a verification link (a button) that you have to click to verify your account. The signup process is simple and straightforward. You already registered your account. That’s why you can now start to fill out the section About Your Date. Once you have done that, you continue with the About Yourself section. In fact, you don’t have to fill out anything. The signup process is designed in form of a multiple choice quiz, which makes it easy to complete. In this section you get asked a bunch of questions about your perfect match. You can select how old she is. You can select how tall she is. 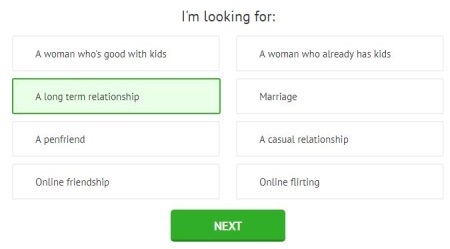 You can select what kind of relationship you are looking for. I doubt that you are looking for an online friendship and I assume that you are looking for a long-term relationship. You get asked all kinds of questions about yourself. These are just a few examples. The most important part of this section is the part where you have to describe yourself. This is the cornerstone of your profile. Don’t skip this step. Now that you are finished with the About Your Date and the About Yourself section, it’s time to show the Ukrainian ladies on this site that you’re a handsome gentleman. Don’t use a fake picture. You want to meet her sooner or later and you want her to recognize you when she’s waiting for you at the airport. Hi Sebastian, great post as always. I do want to point out that this site is in fact a major ponzi, Charles Ponzi will be looking at these people and giving them a thumbs up. I have been on this site for 4 months now and guess what? after signing up, i chose not to upload a picture, in about weeks, i had over 100 letters with at least 90 of them telling me i look great (thank God you can read all the letters you get without paying). After that i decided to tread with caution and i wanted to see those who send more than one letter to me and surprise surprise, the subsequent letter didn’t match the original ones sent but, quite a number of them (letters) were sequential. I may pay for the subscription but it i am not really expecting much from this site. Have a great day. thank you so much for sharing your story. I will look into that, but I can assure you that this would never happen on Russian Cupid or Ukraine Date. Let’s see if the site owners reply to this comment. I know ukrainian women are beautiful, but the women on this site are real? they all look like models. I chatted with some of them and also have a video chat. The one I chatted with on video was real (of course, without the photoshop and makeup). If you are unsure, you can also check out my UkraineDate review and compare both sites. It’s free to join both sites. This is the biggest choice of the hottest women I have seen from any dating site I’ve visited. It’s like a secret paradise for men with exclusive access. And the quality is with women of all ages who want to chat. Cultural differences are not a problem and makes things interested. Women are so open. In my experiene, this is one of the most convenient and loyal dating sites I’ve used. I want to meet a feminine woman Eastern Europe as I heard alot about Ukrainian and Russian ladies. The site is pretty convenient, has a lot of options so it makes it easy to use and the biggest advantage is so many awesome women you can’t find anywhere else. Defintly not where I live. To me, the site is well worth the price and reaps a lot of contacts. You’ll have plenty of dates when you get to Ukraine.